Desiree N. Annis is a 21 year old Museum Studies student at Arizona State University with a lot on her plate. When she’s not running three different blogs, interning in a museum, in class or working at her day job, she can usually be found drinking coffee and researching the decorative arts for pleasure or researching material culture with Asia Arts Phoenix as a side project. She intends to follow up her BA with an MA/PhD, and fully reserves the right to call herself Dr. D.N.A. Yes and no. This summer I interned with the Tucson Museum of Art, and I’m currently still helping them with a few things, but the museum is in another city. So I’m working with them, but not in the museum. In addition to that, one of my Professors just asked me to help work on ASU Art Museum‘s Japanese Manuscript collection by doing some research with Asia Arts Phoenix. I also recently applied for a Visitor Services job at my school’s Art Museum — and I haven’t heard back yet. I don’t know if my schedule is what they need. But right now I work part-time at ASU Gammage Theater. I’m a Floor Manager, which is a lot of fun, because I interact with so many different people, and when I’m lucky I get to see parts of the shows. Last year I saw Beauty and the Beast on stage — and this year I get to work The Lion King, which is going to be amazing. a PhD or two as well. I have three! One of my youngest museum memories was when I was living in Singapore. My mother took me to a museum, and we saw a student-copy of the Mona Lisa. At the time, my father was on a business trip to Paris, and she explained he would go see the real Mona Lisa in the Louvre. I just found it to be incredibly fascinating and beautiful. When I was older, a junior in High School, I met a graduate from a college I wanted to apply to. April was incredibly wonderful about my enthusiasm for just about everything…and when I found out she worked in an actual museum, I said, “Wait, you can do that? That’s a thing people can do?” Working in a museum sounded like the best idea ever. Then my freshman year of college, I finally took my first Art History class, and got a job as a Special Collections and Archives student assistant. There was a moment where I was holding an illuminated Dutch Book of Hours in my hands beside my Professor, and that confirmed it for me. I run three blogs, so between the three, I have about 138,000 followers. My most popular blog is simply “Asian History“. But my museums blog is called The Museologist. I had actually taken that one down and restarted it fresh. But I’ve had my blogs since roughly 2010 onwards. This varies between my blogs: The Museologist is about museums, art, art history, whatever I’m currently working on. I like to post other people’s thoughts and articles, but also to discuss my own take on things. For Asian History, I reblog anything from West Asia to East Asia, culture, history, current events, etc. And lastly, US History Minus White Guys (while the name usually draws a laugh) is an important project for me. I’m Mexican American, and I live in Arizona. There’s been a lot of attempts to get rid of Mexican/Latino studies in my state, preventing kids from learning about our history. And I realized that I knew very little about it myself. So I decided to make a blog that would be nothing but that, in order to learn more about American History and all the things I wasn’t taught, and that my state’s Government wanted to stop teaching. Knowledge is power. This is going to sound bizarre, but I’m pretty sure the last exhibit I saw was part of a front for a cult. To back track a little, I went to visit San Francisco with a friend, and insisted we go see the Asian Art Museum (which was amazing!). As we left, we wandered down Market Street, and ran across a very odd building front with a “Museum” sign, and I absolutely had to go in, it was really very weird. I’m fairly certain The International Art Museum of America is, in fact, tied to a cult. I don’t mean that in a “Oh, I didn’t like it, it seemed odd,” sort of way. I mean 90% of the artwork is by a man who claims to be the third reincarnation of the Buddha, and we were told we couldn’t go into certain rooms. It was free, and the labels were unintentionally quite hilarious, but it’s not really a quality museum. There’s no humidity monitors, or anything to track temperature, half of the pieces are placed over crushed blue velvet…it’s someone’s very earnest attempt to create what they think a museum is supposed to look like. Three books, all from the Asian Art Museum: A Curious Affair: the Fascination between East and West, Awash in Color: French and Japanese Prints, and 1616: The World in Motion. I’m sitting in on a Professor’s East/West graduate seminar, so I brought them to class to show the other two students. Love it! I have twelve younger cousins with a thirteenth on the way, so I definitely am used to seeing it. Personally I like National Treasure better, though. I understand lots of people don’t like films like Indiana Jones, National Treasure, The Mummy, Night at the Museum, etc. because they’re “not realistic” and their jobs “aren’t like that” but that’s what makes it fun. It gets people interested, and we’re all totally aware that mummies won’t come to life and you definitely won’t squeeze lemon juice on the Declaration of Independence. I think most people know that, and like these movies anyways. Which is great, because it means family and friends turn to me and ask, “Wait, they’re not supposed to do that, right? What’s it really like? But what do you really do?” and that’s a big opening for talking about it. Does the Museum have a Research Library in it? I feel like that would affect my choice. As much as I love museums, I love reading. Research is incredibly enjoyable for me — I pile up with notes and post-its, and when it’s my own books — scribbles in the margins. I don’t think I could choose one without the other to have to spend the rest of my life in! That’s already one of my fears: I panic if I think I’m going to get locked into a building overnight. Accessibility. In a word, it’s incredibly difficult to appeal to everyone, especially when the people working in your field know very little about the general populace’s background or life experiences. I was lucky to have a professor to allow me to tackle this problem by comparing museums to comic conventions like San Diego Comic Con. The idea that museums couldn’t be as beloved or widely popular in their culture niche needs to be tossed out. So does the idea that museums are for a specific type of person — which I think will be much harder to do. It’s not easy getting into this field to begin with, never mind attempting it without as many as the privileges as the people before you had. Museums are incredibly important for communities; they need to remain open to the people in them. Whatever might be said about millennials, I think we have the unique ability to do just that — because our expectations, drive, motives, and ideas are completely attuned to a much broader and more diverse sense of community. We’ve been exposed to much more in a globalized digital world, and this is the community we participate in. Once people start using that to their advantage, I think that museums will find that renewing their cultural relevance doesn’t mean having to create an unwelcoming institution for the general populace. 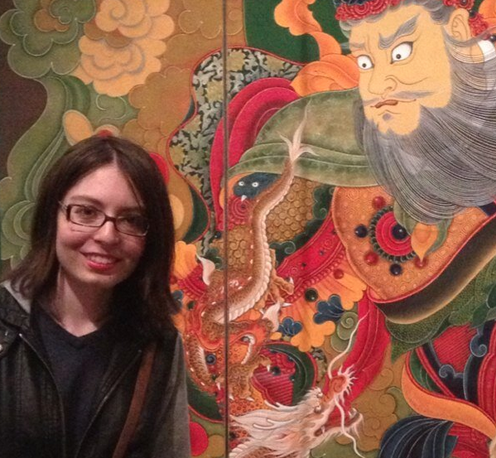 Thanks for participating in Meet a Museum Blogger, Desiree! In case you missed it, Desiree blogs at Asian History, The Museologist, and US History Minus White Guys. Do you have additional questions for Desiree regarding her profile above? Feel free to start a conversation in the comments below or reach out to her directly on Twitter at @MissMuseo. Please use the #MuseumBlogger hashtag. TY! Tags: Arizona State University, Asian History, Desiree N. Annis, museum studies, National Treasure, The Museologist, US History Minus White Guys. Bookmark the permalink. My interview with the Museum Minute.